Welcome to Gulaay – the Indigenous Australian Curriculum & Resources Team. Gulaay is the Wiradyuri word for 'bridge or to cross over', given by Aunty Gloria Dindima Rogers to acknowledge the work being done across the cultures. Gulaay is part of the Division of Learning and Teaching's Learning Academy, and reflects the Division’s ongoing commitment to Indigenous curriculum and cultural competency. We support the Indigenous Australian Content in Courses Policy (2016-20) and CSU's Indigenous Education Strategy in a number of ways. The Indigenous Curriculum & Pedagogy Co-ordinator Dr Barbara Hill is responsible for the co-ordination of the inclusion of Indigenous curriculum and pedagogy in all CSU undergraduate and professional entry courses by 2018. The team is tasked with the creation of original resources to enable this work. Gulaay also oversees the Indigenous Cultural Competence Program (ICCP) and the IES Collection in the DOMS. Stage 1: The Individual Online Cultural Competency Program is available for all staff. This individual component of the journey to cultural competence has as its learning outcomes increased cultural awareness and cultural sensitivity, and should be completed by staff before progressing to Stage 2 of the program. Stage 3: the creation by staff of a Community of Practice to share achievements and challenges and to build institutional capacity. Recommendation 17 Academic Senate, in collaboration with the School of Indigenous Australian Studies, develop a set of curriculum guidelines identifying the broad intentions of Indigenous content and issues to be considered, and that these be included within the guidelines for Course and Program Review and Course and Program Development templates (p.11). These guidelines were presented by Associate Professor Wendy Nolan and Dr Barbara Hill at Academic Senate and endorsed on the 2nd December 2009. All images used in this site were taken in Ngiyeempaa country and permission for their use has been given by Aunty Beryl Philp Carmichael, Ngiyeempaa Elder. Photos by Rosie Mallard- Mueller (supported by Dr John Harper), Professor Robert Davidson and Professor Andrew Vann. Dr. Michelle Evans is originally from the Hunter Valley NSW. Now based in Bathurst, she works as an academic, writer, facilitator and cultural producer. Michelle holds a Senior Lectureship in Leadership at Charles Sturt University, is a Fellow at Melbourne Business School and Fellow of the Research Centre for Leadership in Action at New York University. Michelle is Trustee of the Yvonne Cohen Award for Indigenous Creative Young People. Michelle is also an Indigenous alumni of CSU gaining a Bachelor of Arts (Communication - Theatre and Media) in 1994. 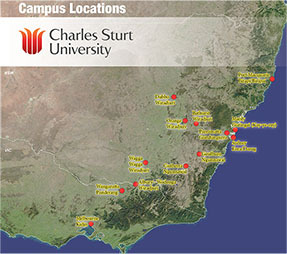 Implemented in 2009, the Charles Sturt University Indigenous Education Strategy and its recommendations provide a comprehensive whole-of-institution framework for engagement with Indigenous communities, positioning CSU as a lead provider of Indigenous education, research and the cultural competence training of professionals of the future. CSU has an ongoing commitment to reconciliation and social justice, and this is demonstrated through the endorsement of the Indigenous Education Strategy.pdf which is further endorsed by the University Strategy implemented by the Vice Chancellor and Academic Senate. 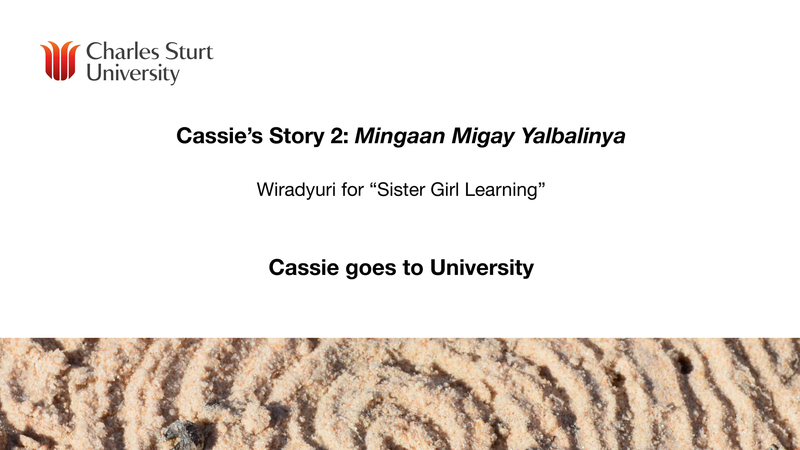 The Curriculum Guidelines for the Incorporation of Indigenous Australian Content into CSU Onshore Undergraduate Programs was developed by the School of Indigenous Australian Studies in collaboration with Academic Senate, in response to Recommendation 17 of the Strategy. 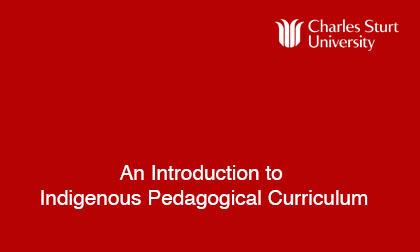 The guidelines are designed to enable Key Objective 5 of the CSU Indigenous Education Strategy by providing a resource to assist academic staff, educational designers and others in the development of Indigenous Australian content at subject and course level and strategies for effective delivery and assessment of student learning. Charles Sturt University is committed to the process of reconciliation between Indigenous and non-Indigenous Australians. As Australia's leading national university of inland Australia, it recognises the particular role and responsibility this tertiary educational institution has in promoting social justice and human rights for Indigenous Australians, both nationally and within the footprint of Charles Sturt University. This statement of reconciliation was adopted by University Council on Friday, 7 December, 2007. 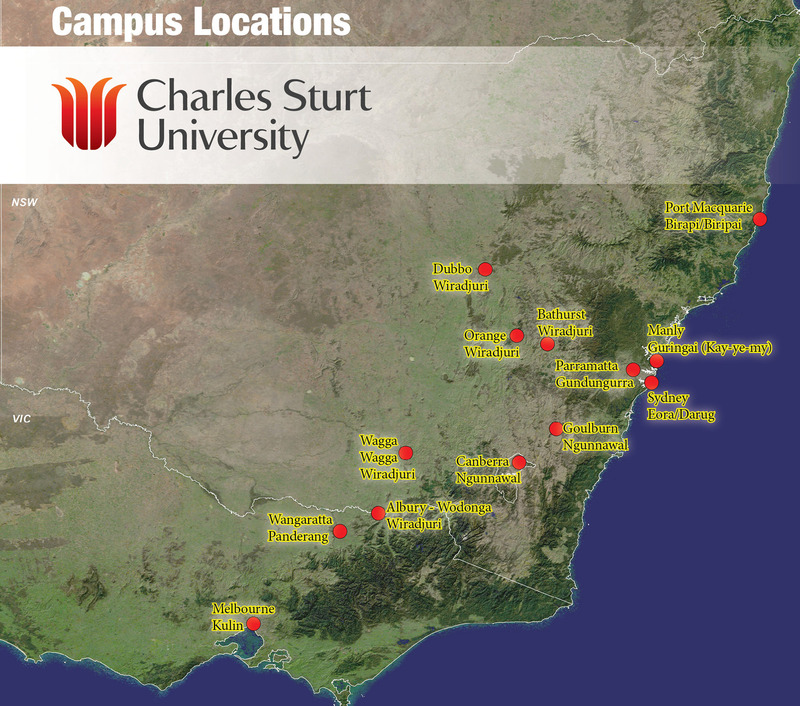 Charles Sturt University campuses are located within the area occupied by NSW's largest Aboriginal group, the Wiradjuri, extending over land in the south western slopes region from the Blue Mountains in the east, Hay in the west, north to Nyngan and south to Albury-Wodonga, and bordering on the Brindabella Ranges and Kosciusko National Park. The Wiradjuri Nation area has been described as "land of the three rivers": the Wambool (later known as the Macquarie), the Kalare (later known as the Lachlan) and the Murrumbidgee. The Murray River forms the Wiradjuri's southern boundary, while the change from woodland to open grassland forms the eastern boundary. It was a land once described by early European explorers as 'fertile, abundant in fish and game'. Wiradjuri is also the name of the language used by the traditional owners of the area, which is also rich in story and song. CSU also has campuses in Canberra, Port Macquarie, Goulburn and Parramatta, a specialist centre in Manly, CSU Study Centres in Sydney and Melbourne, and pathway programs in agricultural business management and agriculture available in Wangaratta. We acknowledge the Indigenous peoples of these areas... the Ngunnawal of Canberra, the Birapi/Biripai of Port Macquarie, the Gundungurra of Parramatta, the Eora/Darug of the Sydney basin, the Kulin of Melbourne and the Panderang of Wangaratta. We honour and respect these nations and extend that respect to the Elders of these nations both past and present.